Russell and Kitty here. Stretch Tuesday is here once again! Several people have asked about displaying the carnival and stretch glass together. 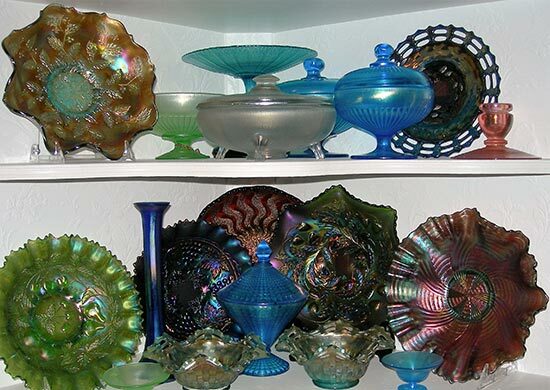 For us it is really easy: a whole cabinet of patterned carnival glass can really be confusing to the eye so by adding some plain pieces of stretch glass; the patterned carnival pieces can easily be seen. 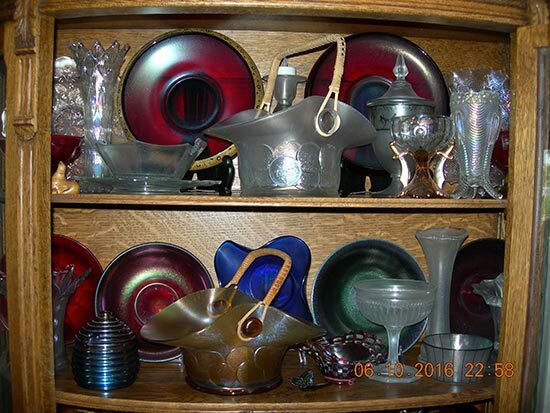 We’ve included several pictures of our cabinets showing the carnival and stretch glass displayed together. Love Richard Cinclair’s tangerine pieces. Thanks so much for sharing the pictures with us. Have included two pictures of some tangerine pieces. 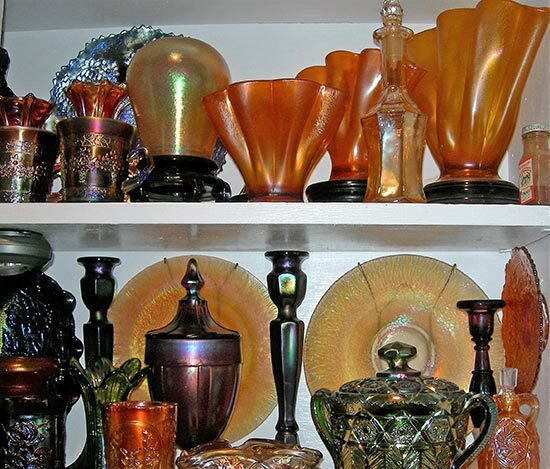 The tangerine stretch glass pieces are so diverse in color that it would make a beautiful collection all by itself. 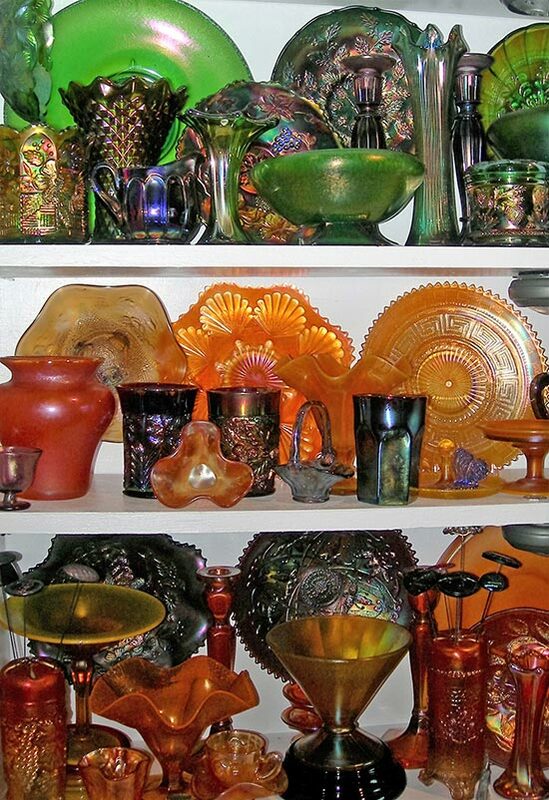 Fenton Art Glass Company is the only company to produce tangerine. 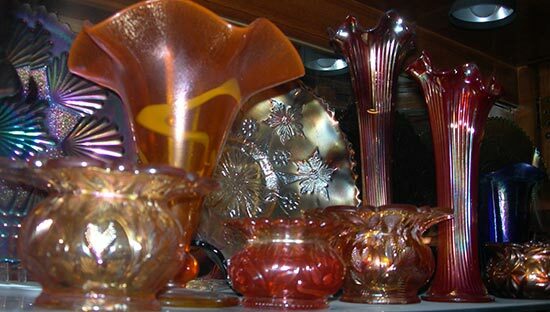 Some of the other glass company’s produced an amber glass that is similar in color, but when compared to the tangerine color there is a difference. 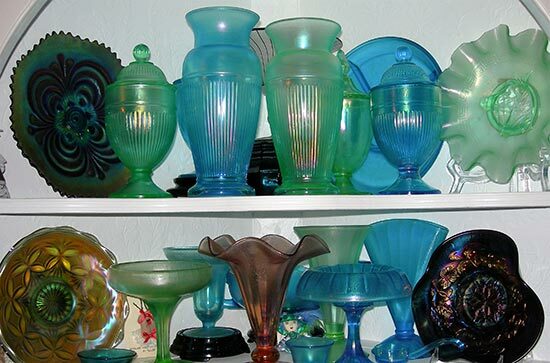 Don’t forget to make your reservations for the Stretch Glass Society Convention. Put July 27-29, 2016 on your calendars so you can attend the SGS Convention in Marietta, OH. Hope to see everyone in Marietta, Ohio!! !